The new model big bag filler has removable bag holding frames. These give safer and speedier fitting and removing of all big bags. The bag platforms rise and lower on powered belts so there are no hydraulics. Operating the machine is semi automatic. When the empty bag is in place press a button then the filling of the bag is automatic. 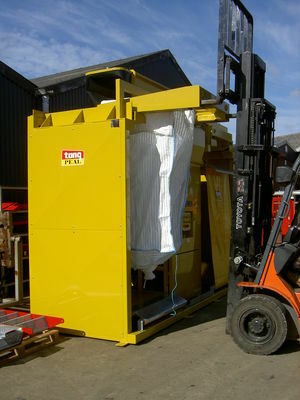 Weighing of the bags is an option with load cells fitted at the top of the machine so positive weighing is made.